Our Czech member Slezská Diakonie has been recently awarded by the Senate of the Czech Republic for its quality results in providing social services. At the official ceremony held in Prague, both our member’s projects under nomination received an award. The first Slezská Diakonie’s project to be awarded was “Service Effatha new jicin”, based on therapeutic workshops for persons with disability, including a theatre class. The project was recognised in the outpatient services category for quality results in establishing partnerships with private companies and promoting the integration of people with disabilities in society. Our member was also awarded for its project “Ostrava service”, carried out in a nursing home run by our member and aimed at implementing innovative work methods with people affected by dementia. 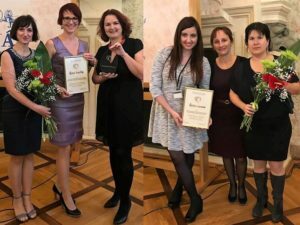 “These awards – said Slezská Diakonie Vice-Director Romana Belova – are the result of our long-term work to improve quality in providing social services. We thank our staff and we hope that this recognition will be inspiring for our work in the future”. Our member Slezská Diakonie is also committed to improving quality in social services within the ongoing Erasmus+ project “Q-Europe: Trends and challenging influencing quality in long-term care”. The project partnership, led by our Czech member, includes Eurodiaconia, our Italian member Diaconia Valdese and the University of Trnava (Slovakia). After four regional workshops on quality measurement in LTC, the project will be concluded with the publication of a new handbook for staff working in the field. To know more on Slezská Diakonie’s work in providing social services, please visit our member’s website.